CHE is off having a picnic today. Aww, come on. Stop editing the Friday puzzles to be so easy! We need a little more bite. This 70-worder is just 63a: TOO EASY. 15a. [Natural energy source], GLUCOSE. I had the G and wanted GEYSERS or GEOTHERMAL to work here. 20a. [Strong connection? ], HAYMAKER. As when your fist strongly connects with its target. 10d. [Food processors, informally], TUMMIES. Not the small kitchen appliances. 28d. [Where Molson Coors is TAP], NYSE. For other apt ticker symbols, check out this Sporcle quiz. 37d. [___ Vogue], TEEN. Teen Vogue has had some great political news coverage in recent months, I kid you not. Here’s their News & Politics page. 44d. [Dieter’s piece of cake? ], SLIVER. In my household, we are the masters of cake and pie slivers. We are not dieters. Top fill: FRANZ FERDINAND, which I’m fairly certain Damon originally clued as the rock band. RAM HOME, PIZZERIA, VORACITY, ZEN GARDEN, CHARM OFFENSIVE, FOMO (“fear of missing out”). Blah: ECU, OLEO, APSE, NEEDLER, ILO. Questionable: 20d. [Humorous as opposed to strange], HA HA FUNNY. I feel like “funny ha ha” is what people say. The portmanteau-pun is an odd beast. They lack surface sense, unless you separate them out. You have to read PIGNORAMOUS as PIGIGNORAMOUS to understand it. Still these are cute, and very consistent, in that a single letter is added at each word’s beginning, and each new answer creates an animal at its beginning. There is a slight demerit for CATTITUDE, which feels as though it is already somewhat in the language… PIGNORAMOUS, LAMBITION and, especially, SLOTHARIO are delightful though; SQUIDDITCH rounds up the set. We get a second dose of SSA, to reinforce it (hopefully). ALMAY was unknown to be, but Google immediately suggests I buy various snake oil from local Amazon rival takealot on Googling it, so it’s more a personal thing. You’d expect it to show up a lot more, given the letters. So make a note! HOMEICE and (W. Somerset) MAUGHAM are also good entries, the latter apt for literary Ms. Varol! This entry was posted in Daily Puzzles and tagged Damon Gulczynski, Damon J. Gulczynski, Dave Cuzzolina, Patti Varol. Bookmark the permalink. Ironically enough, I didn’t know FOMO and had EVER for OVER, so NYT would have been too easy if I hadn’t missed out. Actually my original clue did *not* reference the band, (although I do quite like “Take Me Out”). You can find out what my original clue was (as best I remember it) and read my recap of The Indie 500 tournament, if you are so inclined, at my blog scrabbledamon.blogspot.com. I actually struggled with that because I was solving on paper and wrote in ARCHDUKE….before I realized the whole thing didn’t fit. Then I got the F from SHAFTED and wrote in FERDINAND. In short, my puzzle is a mess and even though I knew the answer I still got it wrong twice. And Amy, I agree that FUNNY HAHA is the more common phrase. As best I could tell at the time I made this puzzle, “ha-ha funny” and “funny ha-ha” were used with roughly equal regularity. I always say the former, but most people who are commenting on it say they use the latter ¯\_(ツ)_/¯. I wonder if that’s regional. You’re right–your original clue for FRANZ FERDINAND was a lot more interesting than the NYT clue. 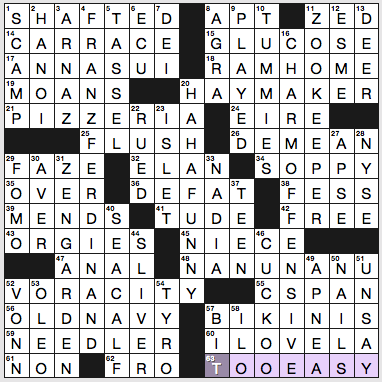 Surprising that Will Shortz would dumb it down like that for a Friday. I liked this one. Would have been very easy for a Friday except that it took me a while to untangle the NE corner — GLUCOSE and TUMMIES were clever misdirections. I agree that HAHAFUNNY is the wrong way round, in my vocabulary at least. Mr. Black: Well, kids, I promised you a little treat in lieu of dinner, and here it is. The man who took an abandoned mule tannery, and turned it into a summer wonderland: Mr. Krusty the Clown! Bart: [half-crazed] See? I told you Krusty would come! Just like I said! [laughs maniacally] He’s gonna bring us food, and water, and smite our enemies! Mr. Black: Now, I must tell you kids Krusty has laryngitis and a bad back, so he won’t be saying anything or doing anything. Lisa: He’s really having trouble keeping his balance! Ralph: He’s still funny, but not ha-ha funny! Bart: [angry] That’s not Krusty the Clown!! My vote is for ha-funny-ha. Hm, that sounds like a place in either Florida or New Jersey. I think ha-ha funny is more responsive to the clue. His joke was more ha-ha funny than strange or weird funny. The puzzle was average+ difficulty for me. The first O in FOMO was the last to fall. 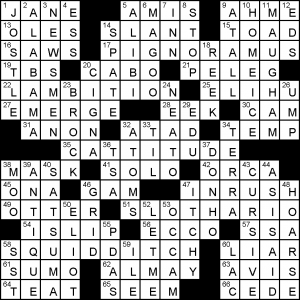 All I can add is I liked the NYT puzzle, but the original clue for the Archduke wouldn’t have been any more difficult than the one that ran, I don’t think.